More creative or daring types might consider doors such as these. These double exterior doors are finished with two complementary, warm shades of brown and orange. These doors are a two panel design, and each panel is finished in custom trim, painted orange. The background of the doors and the background of the panels are painted orange, which makes the detailing of the trim and panels more pronounced. 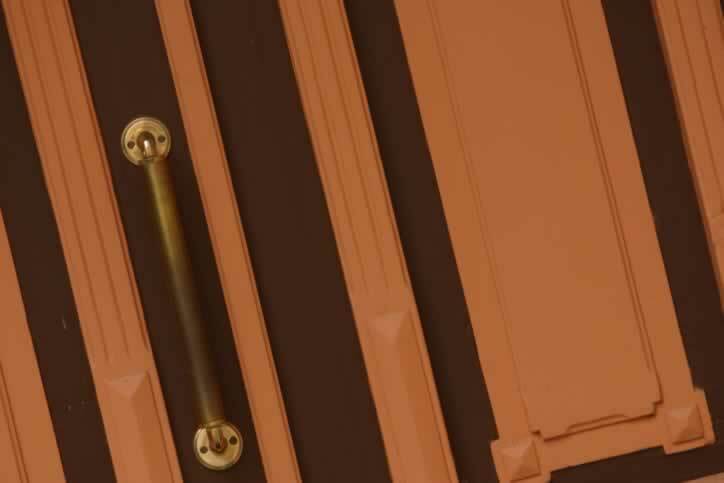 For doors of these size, heavy hardware is necessary, such as the brushed brass door bar handle here. As there is no visible lock, it is likely that these doors only lock from the inside. The enamel appears fresh; the orange color is bound to show wear and the brown will show any light-colored dirt or debris. In order to protect the bottom rail of these doors, a matching brass kick plate should be installed.